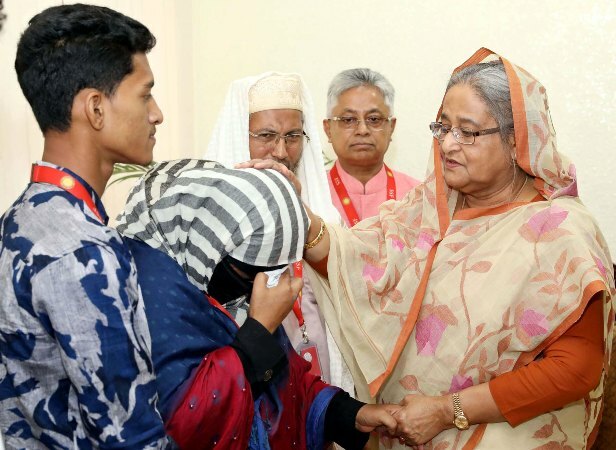 Prime Minister Sheikh Hasina on Monday reaffirmed that no one of those involved in the killing of Feni's madrasa girl Nusrat Jahan Rafi will be spared. Sheikh Hasina made the remark when Nusrat's family members met her at her office, said PM's Press Secretary Ihsanul Karim. Nusrat's parents -- AKM Musa and Shirin Akhter -- as well as her two brothers went to the Prime Minister’s Office in the morning. “No culprit will be spared from legal action,” said Sheikh Hasina assuring the family members of extending all sorts of support to them. Nusrat, a student of Sonagazi Islamia Senior Fazil Madrasa in Sonagazi upazila of Feni, was set afire on April 6 allegedly for refusing to withdraw a case filed against principal Siraj Ud Doula of the madrasa for sexually harassing her last month. After fighting for life for five days, the madrasa girl died at Dhaka Medical College and Hospital (DMCH) on April 10.